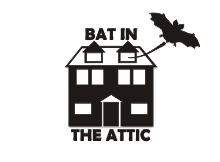 There are two new uploads on Lythia.com, a repository of various fanon Harn articles. The first is a continuation of the excellent Friends, Foes, and Followers series. Even if you don't use the Harnmaster stats the character backgrounds serve as excellent idea generators. And the illustrations are excellent as usual. The second is a detailed description of the Delwyn Hundred a lightly populated region north of Thay. Tim had his second session of his AD&D campaign last night. 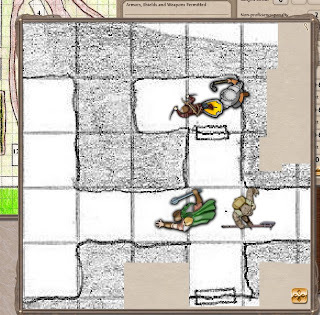 Rusty Battle Axe joined in although we had technical difficulties with Fantasy Grounds. We gave up and plan to fix it later this week. Probably something to do with firewalls and their setup. What made it strange that his gamemaster mode looked like it would have worked. But the player side didn't work. So we did voice for Rusty and trusted his die rolls. Fed him the maps through Skype downloads. Grim, Corum, and Boog woke up the next morning after the Goblin Raid adventure and got breakfast. Boog collected the extra bacon rations that were owed to him. He let the soldier (the one he gave the shield too) keep half of his bacon as Boog was feeling good about everything. After breakfast the party headed into the woods where they spotted Waleron talking with an elven mage. Mage was new to the area and not at the forts when the pass collapsed. The Elven mage went over and talked to the party and offered to take items that weigh no more than 5 lbs with him. He wants a large fee to do this. Unfortunately this meant that Boog couldn’t send his Ma a message. She is working at the Green Stag Inn at the Wayfarer’s crossing. Waleron look pissed because the party was there. The party made it to the goblin cave without incident. Boog gives Corum the potion of healing. Once inside the party makes their way further into the caves where they find a room filled with goblins eating, sleeping, and gambling. After carefully planning, the party attacked and had the element of surprise. The fight didn’t go so well as nobody could seem to hit anything including Boog. Boog fumbled his halberd away and it nearly turned disaster when Boog critically fumbled with his mace and KOed Corum in the head. Boog and Grim managed to kill the rest of the goblin and got out of the cave with Corum. The party got back to Jedebiah’s Bastion and got Corum healed. Waleron mocks Boog for his ineptness. Boog gets Corum’s helm fixed at Henry (the smith) while Grim talks to Jonathan. Jonathan wants to work out a deal with Grim to get some goods into his shop to trade with. The party works at their jobs the rest fo the day (Grim, leatherworker, Boog, teamster, Corum, healer). The party meets Sterling that night and after giving the report Sterling arranges for a fighter named Dixin to join the party. He wields a spears and seems like a good person. That night, while trying to get to sleep, Boog wakes up after a snake bites him. Luckily the snake wasn’t poisonous according to Henderix. When Boog some back he finds Waleron and his cronies laughing at him and Boog punches Waleron in the face. Everybody backs off before the fight turns serious but Waleron and his goons back up everything and leave the fort. Waleron tells Boog that he just signed his death warrant. The next morning Boog and the party (plus Dixin) leaves and heads to the goblin cave. They find Bear the Trapper with the crap beat out of him. Apparently Waleron and his goons attacked him and stole all his equipment including traps. Boog give Bear his special dagger (normal but a fantasy bowie knife). Bear appreciates this. 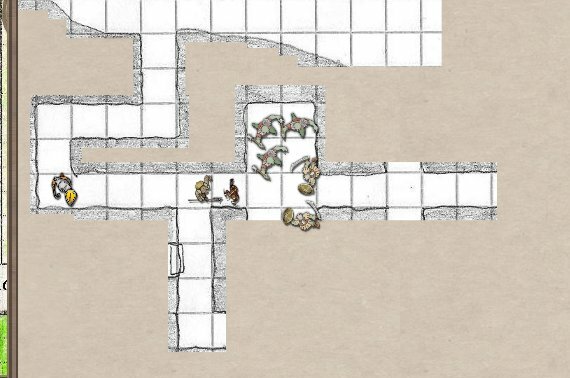 The party decides to deal with the goblin cave first and head there. Once in the party try to sneak in carefully but sets off an alarm trap. The party manages to hide in time except for Boog who starts fitting a big goblin with a magic sword. 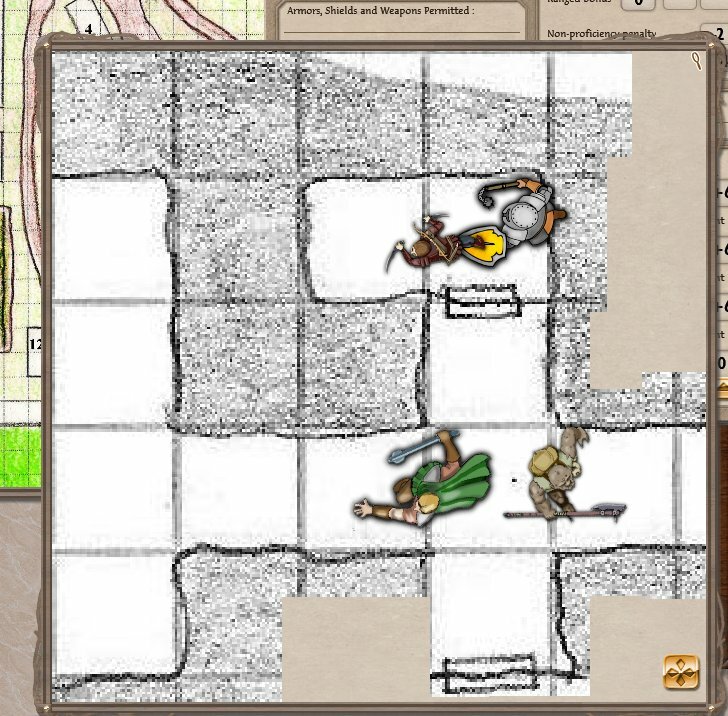 The goblin is quickly killed and looted. 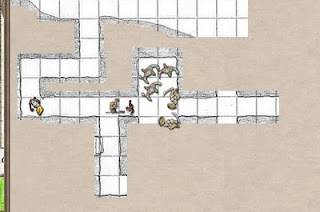 The party heads deeper into the caves and finds a unused crossbow trap at the end of the corridor. The crossbow needs repaired to usable. The party opens one door and find nothing, opens another and finds what looks like to be a shrine. There is a silver bowl on a altar, a dead goblin before the altar and a curtain dividing the room. The bowl is carefully taken. The curtain was open to reveal a hideous statue of a god and then a bunch of rot grubs fell on Corum and Grim. Brian got to 2nd level as Grim which is great he now has 11 hit points and better skills. Tim's critical tables are brutal but they mostly work in our favor except for Boog's head shot on Corum. Looking forward to next week. Grimtooth's Trap is available again! 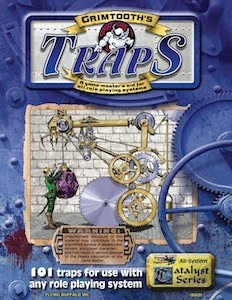 You can buy the PDF of Grimtooth's Trap on RPGNow or E23. Hooray for an old favorite reappearing. Now we just need the City Books. Monday Tim ran the first session of his Into the Dark Land campaign.The characters was me playing Boog and Brian playing Grim a Halfling Thief. The session was pretty good. One outstanding item as Tim's Background notes. 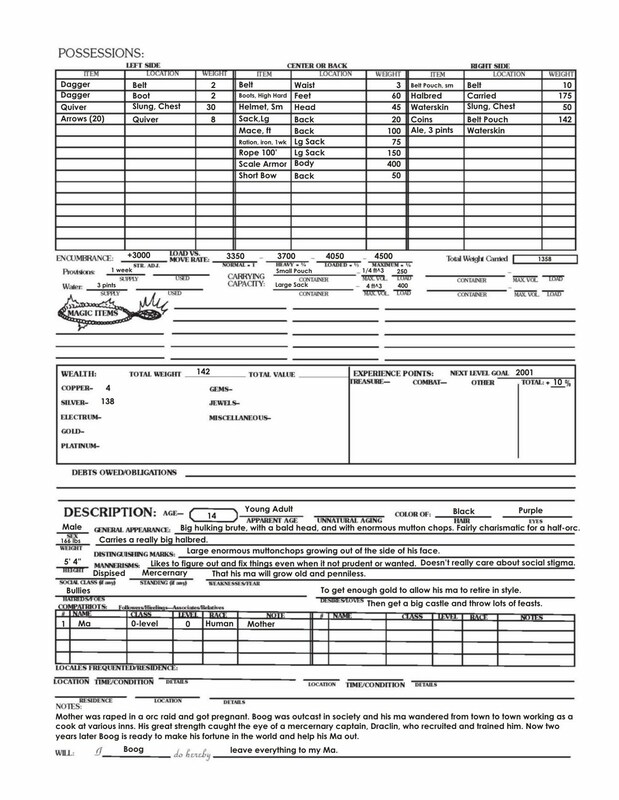 Not only they were well written and interesting they were formatted like a professional product. 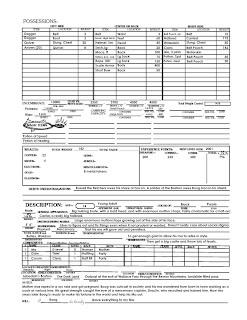 You can see a copy of the campaign start document. We started out in Jebediah's Bastion. Boog thinks that complicated so calls it Jeb's Place to himself. Boog came here to find enough gold so that his Ma wouldn't have to work in the inns anymore (she is a cook). Jeb's Place is at the exit of Wallace Pass the only way through the rugged Reznor Mountains. Beyond are the Dark Lands. Named because the of surrounding high mountains limiting the hours of full daylight. 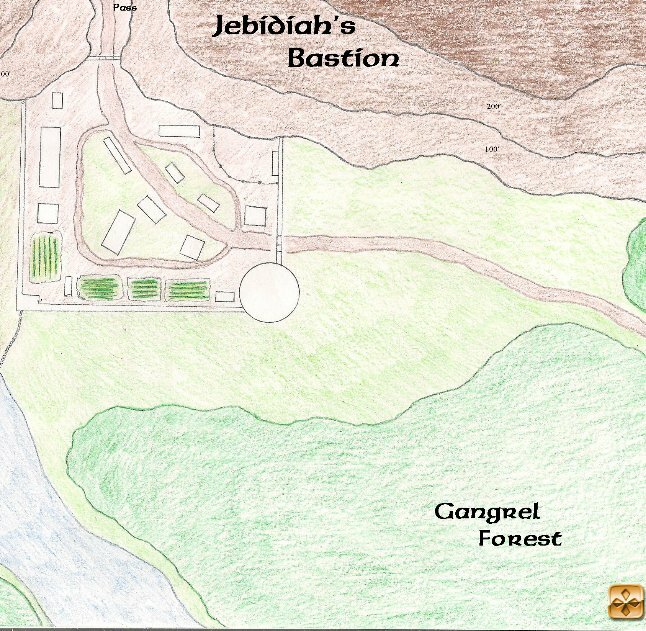 Goblins, Orcs, and other humanoids like it here and it all prime land. Unfortunately bad luck strikes and a major landslide covers the pass blocking the only way back to civilization. Of course the goblins hear of this and attacks Jeb's Place and thus the campaign begins. Just to let everybody know, Tim has a distinct style of drawing maps that I think is great. I am flattered to draw maps for him and probably do better on the actual dungeon maps. But he really should use his local maps, like the above of the bastion. 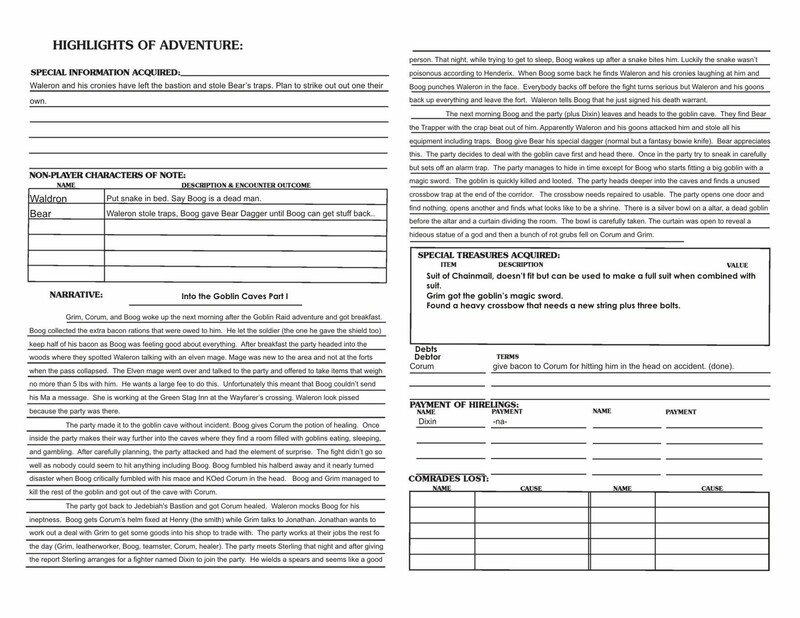 Especially that RPGNow has a cheap full color option (16 pages for $3 or so) for publishers to use. They are great to look at and very evocative of his setting. Goblin’s attacked Jebediah’s Bastion. Boog and Grim stationed at the pass exit. Ten goblins repelled down. Boog killed seven while Grim killed three. Grim gets knocked down to zero hp while going after Russell the fletcher. Boog kills the goblin, and Russell promised Boog his share of bacon, especially after Boog gives him the metal from two swords. Grim revives and is helped to the shrine to be healed. Boog takes the swords to Henry the blacksmith and gets 8 tokens for later use. Waldron calls Boog an idiot and Boog beats him after connected with two blows. Hendrix lectures Boog about fighting but heals him anyway. Commander Sterling wants to see Boog and Grim at the tower. Commander Sterling wants us to go into the woods and try to find the Goblin Lair. Promises us extra rations as an award and will consider it a favor. We agreed and went off to get something to eat. We talk to Corum, our friend who is also a cleric, Corum is bummed that he can’t go. Grim promises to talk to Sterling about it. We go to sleep and in the morning head out to the forest. At the gate, the soldier ask Boog to get a shield for him. Boog get him to agree to give his share of bacon for the shield. Grim and Boog head into the forest and walk for a while. At one point Grim smells smoke from a settlement. When Boog and Grim scout around they see a boar. Boog immediately starts hunting the boar with Grim nagging at him. Boog shoots the boar and then charges it. Then fail save and get caught in a net trap set by four Goblins. The four attempt to shoot Boog but only one manages to hit. Grim sneaks around and backstabs on of the Goblins. Boog rips free from the net, while the goblns take more shots at him. Luckily Boog doesn’t take a hit. Boog and Grim take down the remaining goblins and finds one of them alive. While interrogating, the goblin reveals that the Goblin Chief has hidden his treasure in the woods and he knows where it is. However Grim had a enough and kills the goblin. We kill the boar and string it up to drain. We head down a path and find the Goblin cave, Boog and Grim surprise two Goblin guard, unfortunately one of them gets a lucky hit and Grim goes down. Boog manages to take down both and carries Grim out of the cave. Then Boog gets the two goblin bodies and hides them outside. Hopefully the chief just thinks they ran off. On the way back Boog and Grim spotted Smoke, one of Waldron’s flunkies, searching the ground of a clearing. After a while he finds something, notes the spot and leaves. Boog watches as Grim searches who finds a locked box buried. It is guarded by a swing tree spike trap which is disabled. The box is dug up and Boog puts it in his pouch. Boog had to make a save when he accidentally set it off while trying to hid to give Smoke a surprise. Boog and Grim make it back to the Keep. Everybody cheers at the sight of the boar carcass. Boog and Grim reported everything but the box to Commander Sterling. Sterling agrees to have Corum accompany us back to the goblin cave. After getting Grim healed they goto the shrine to open the box. Corum doesn’t like this and thinks we should report it. Inside we find two healing potion. Grim gets one, he needs it, and Boog gets one after Courm said he would turn it in if he got it. Boog plans to give it to him at the cave. I am also in the middle of writing an account from Boog's point of view. I will post a pdf link when I get it done. The critical hit system was simple and bloody, I will leave it to Tim to post the details on that. We handled pummeling with a normal attack roll and doing 1d3 + str bonus for damage. I think it was 1/4 real and the rest subdue damage. I was real lucky to have the 18/00 strength as I think Waldron was somewhat higher than Boog. 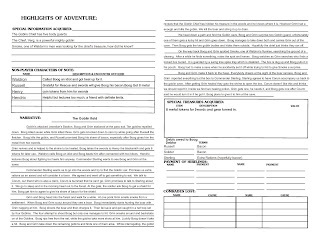 This is a copy of the the adventure record both the front and back. The updated character sheet front and back. 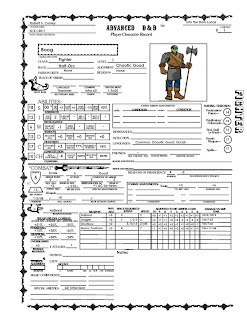 Looking forward to see what happens in the next session and having the Rusty Battleaxe join as his cleric Corum. 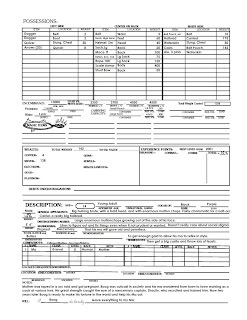 Note: These sheets can be gotten from the Mad Irishman. How many "Interesting" hexes should you have? Over on TheRPGSite Noisms asks how many hexes in a hexcrawl map should you have something preplanned for? I would shoot for 10% to 20% detailed hexes. In the dozen or so sandbox settings I wrote so far that what I averaged. Out of 512 hexes Blackmarsh had 76 detailed hexes. Most people have a dozen detailed ideas, two dozen more sketchy ideas, and for the rest that why God invented random tables for. A good set of random table is worth it's weight in gold as it is easier to explain why something is then make it out of nothing. 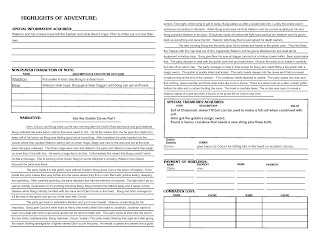 Remember it is meant to serve as a framework for you, the referee, to fill out in detail as the players traverse the landscape, and have adventures. Not as a fully fleshed out world detailed to the nth degree. So in the end it boils down to whatever you need to get at the proper area in your "Bag o' stuff" to construct the various encounters the players run into. It been two years since I published the Majestic Wilderlands supplement. I didn't include all the details of magic developed using GURPS and other rule systems. In addition I continued to run Swords & Wizardry and had to make rulings related to magic. 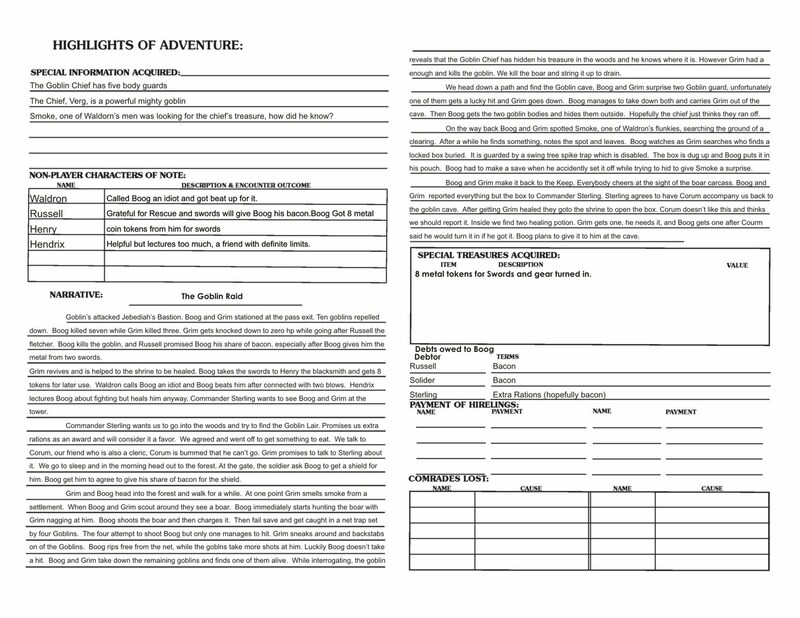 So I decided to start writing them up and expand them for use in further adventures. In the Majestic Wilderlands Supplement I give information about the Chromatic Crystals. Nine crystals used to seal the Abyss after the gods banished the demons. The crystals include a tenth crystal, a master crystal, the Chromatic Crystal. The crystals have an important influence on magic in the wilderlands as detailed in this post. In the Dawn Age, magic could only be cast through elaborate rituals. The level of ambient mana was too low to permit casters to memorize spells to cast at a moment’s notice. Through rituals the mana was slowly gathered and infused into an item such as a scroll, charm, or wand. Only then it could be quickly released to create the spell the caster desired. After the Uttermost War, the gods imprisoned the surviving demons in the Abyss. To seal the Abyss from the Wilderlands the gods created ten crystals of powers. Nine of which were set around the entrance and the tenth, the Chromatic Crystal, was used to activate them and seal the Abyss. A consequence of this was that the ambient level of mana was greatly increased. The crystals gathered the ambient mana, cycled it through their lattice to power the seal, and then released back in a concentrated form into the Wilderlands. Suddenly magic-users found they no longer had to rely on lengthy rituals to gather the necessary mana to power a spell. Instead a complex series of mediations allowed the caster to prepare to cast a spell at a moment’s notice. When needed the magic-user use his will to open a channel to let the mana flow through the spell’s form which created its effect. Each of the crystals was created by one of the gods. They imbued their inner essence into each crystal’s lattice to add to the strength of the seal. This also subtly altered the mana after it flowed through the crystal. When the Order of Thoth, the Elves, and others studied magic, they found that certain mana worked better to create a particular effect. There are nine types of mana, each based on one of the crystals used to make the seal to the Abyss. In addition there is a tenth type of mana, the original ambient mana left over from the creation of the Wilderlands. The study of the ten types of mana is universally known as the Arts of Magic, a near universal nomenclature has developed to describe each type; The Claw, The Eagle, The Flame, The Hearth, The Lantern, The Skull, The Storm, The Tree, and The Web. The original ambient mana is known as The Forge. This mana is best used in spells involving creatures and monsters of the wild. It originates from the Ebon Crystal created by the blood goddess, Kalis. This mana is best used spells involving movement, protection, and air. It originates from the Crimson Crystal created by the goddess of justice and honor, Mitra. This mana is best used in spells involving fire. It also works well with mastery of the natural world and the body. It originates from the Ochre Crystal, created by the god of war and order, Set. This mana is best used in spells involving earth, healing, and the body. It originates from the Emerald Crystal created by the goddess of healing and the earth, Dannu. This mana is best used in spells involving knowledge, and symbols. It originates from the Amethyst Crystal created by the god of knowledge, Thoth. This mana is best used in spells involving death, and life. It originates from the Ivory Crystal created by the god of judgment and death, Hamakhis. This mana is best used in spells involving weather, and water. It originates from the Indigo Crystal created by the god of thunder and warriors, Thor. This mana is best used in spells involving plants, and the spirit. It originates from the Azure Crystal created by the god of forests and dreams, Silvanus. This mana is best used in spells involving the mind, divination, and illusions. It originates from the Amber Crystal created by the goddess of fates and pleasure, Nephthys. The original ambient mana is best used in spells involving the control of magic, also the creation, control, and manipulation of objects. While the most difficult to use it is the most powerful and versatile form of mana. It originates from the creation of the Wilderlands and many associate it with the Chromatic Crystal created by the High Lord Veritas, the god of creation, and artifice. Tim is starting up a new AD&D campaign. 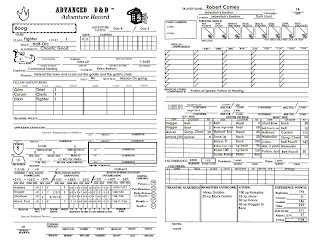 He sent us the character generation rules which is 4d6, drop the lowest, do this six times. So I rolled a 18,12, 7, 15, 12, and 13. So close to being a ranger. But I decided to go with fighter going with Str 18, Int 12, Wis 7, Dex 12, Con 15, and Charisma 12. 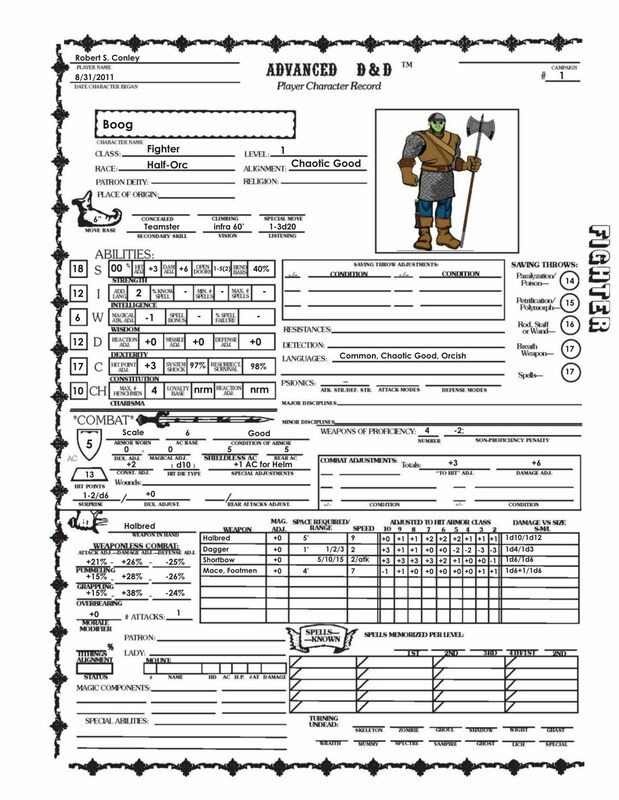 I rolled a 92 for exceptional strength. 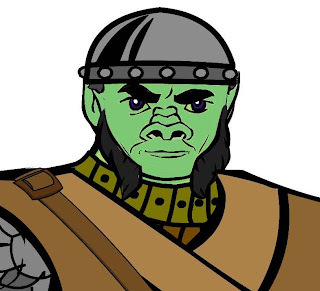 After thinking about it, I decide to play a half-orc. I figure the +1 to strength will get me the rest of the way to the prized 18/00 and the +1 constitution is nice as well. -2 to charisma is a hit especially I wanted one of Boog's goals is to build a castle to hold lots of feasts. But a 10 is workable. Along the way I rolled age and Boog is 14 years old, a young adult. Looking at the DMG, he gets another +1 constitution, but a -1 wisdom. Taking it down to a 6, yikes! 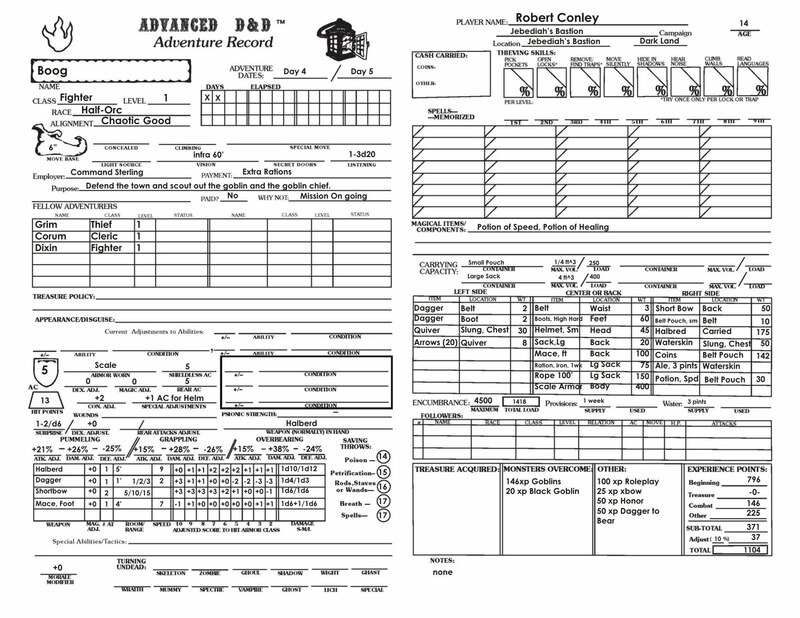 I downloaded Mad Irishman's original AD&D character sheet PDFs. I save both sides as a jpg and used them as a background in CorelDRAW to write on them. Had a lot of fun doing this and went all the way filling out everything including weapon speeds, weapon modifiers and the always fun, pummeling, grappling, and overbear modifier. Then I printed it out using some goldenrod cardstock I had stashed away. Here the completed character sheet. Boog's driving ambition at the moment is to get enough treasure to allow his ma to retire in style. 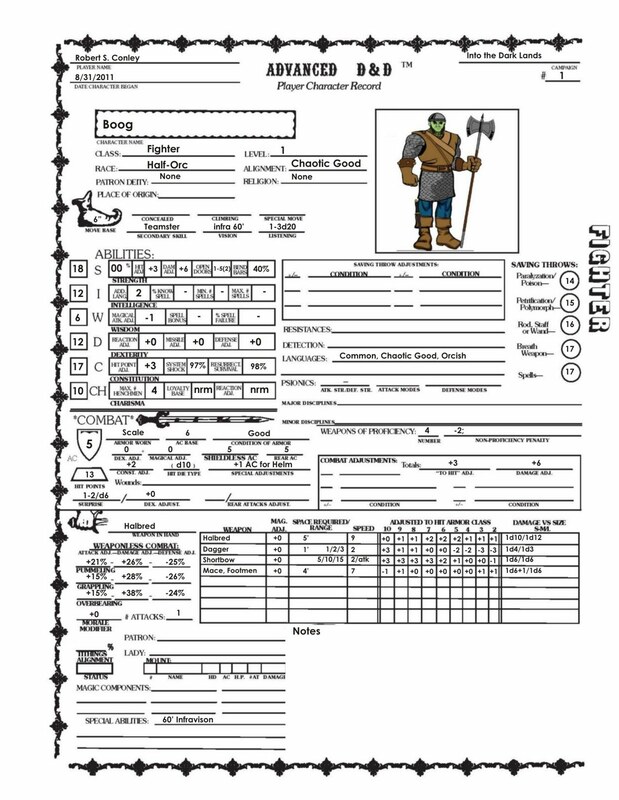 I have a personality for Boog developed during a couple of convention games where I played a half-orc fighter. It a bit hard to describe, but people seem to enjoy and the inane solutions I came up with. For those of you without CorelDRAW, you can use Paint.NET or inkscape. 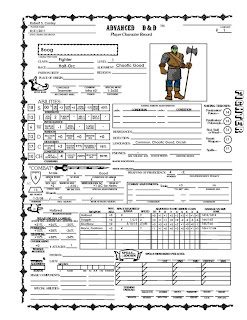 Just save the character sheets as 300 dpi jpg. (you need to set the option when saving from Adobe). Put them on a bottom layer. Then another layer on top where you type in your text. I used 8 and 6 point text to get stuff to fit.